The Pen’s quest for a fourth Stanley Cup ended last night with a 1-0 loss to the Tampa Bay Lightning, a real heartbreaking loss. Not that all playoff losses aren’t heartbreaking, but you just had the feeling that the Pens were just one lucky bounce away from moving on to the next round. I do have to give Tampa Bay some credit. They played a solid series, fueled by 41 year old Dwayne Roloson in net and by all accounts derserved to win the series. They capitalized on chances nearly every time they got them and Pittsburgh didn’t. The lone goal was scored by Sean Bergenheim, on an absolute identical play that they scored on in Game 6. With Dominick Moore going around the net, he dropped a blind pass back to Bergenheim who, with Marc Andre Fleury moving to the far post, slammed it into a half empty net. Not that the Pens didn’t have their chances. They finished the game 0-5 on the powerplay, including a six on four for the final two minutes of the game, making them an abysmal 1-35 on the man advantage in the series. I don’t want to talk too much about last night, just wanted to touch on it. This has been one hell of a season with a lot of ups and downs along the way. CONSOL Energy Center opened this year, replacing the Civic Arena, where the Pens called home for over 40 years. Although we lost the inaugural game to hated cross-state rivals the Flyers, you could just feel the excitement in the building. The consecutive sellout streak also rolled on, eclipsing over 200 at the end of the season. That just shows the support and the dedication of the fans in Pittsburgh. 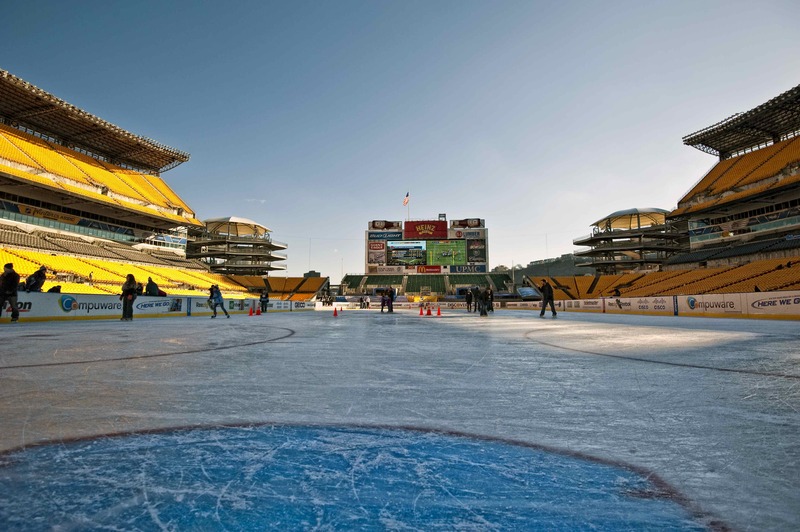 We hosted the Winter Classic this year at Heinz Field against another rival, the Washington Capitals, as well as being featured in the HBO special, “24/7”. Again, the game didn’t turn out exactly as hoped, as the Pens were handed a 3-1 defeat, but that was an experience like no other. The game was supposed to be played in the afternoon, but inclement weather pushed the game into the evening, underneath the lights, and with 68,000 plus fans screaming, it didn’t matter if there was a monsoon, it would have still been incredible. However that game will live in infamy, as that is the game where Sidney Crosby suffered a concussion after he took a blind side hit from David Steckel that ended his season. The injury most likely occurred during that hit, but ironically, it was a hit the following game by Victor Hedman of the Tampa Bay Lightning that sidelined him for the next three and a half months, the same Lightning that just ended the Penguin’s season last night. Sid wasn’t the only one to get hit by the injury bug this year. Evgeni Malkin took a hard hit by Tyler Myers of the Buffalo Sabres that tore a ligament in his knee. Jordan Staal, out the first few months after recovering from foot surgery from an injury suffered in last year’s playoffs, got sidelined again in late October by a broken hand in practice. Mark Letestu and Dustin Jeffrey suffered knee injuries as well, and Arron Asham and Eric Tangradi both, like Crosby were victims of concussions. The final count in man games lost due to injury was nearly 400, yet they were still able to get within 13 victories of the Stanley Cup. All in all, it was a great season, a fun season to watch and be a part of as a fan. About the shots in this post, all taken last night. The top shot is one that I’ve been trying to get for a while, and I finally got it last night. I had been trying to get a silhouetted fan waving their rally towel and I think that this one game out pretty good. The next one is someone holding up a beer toasting the Pens, and this one will be my post on flickr today. The next two are both from after the game, one during the handshake between the two teams after the series and the other of the Pens holding up their sticks in salute of the fans after the game. Lastly, I threw on in there from the walk back to the car, because I like how the bokeh turned out. One more time…Let’s go Pens. Well, you know I have to do it. Ok, so maybe you don’t know what “it” is, especially if you aren’t a hockey fan. But if you have been following my blog you know I’m kinda sorta a big Pens fan, and you would also know that they are in the first round of the playoffs right now. And last night’s game…well…it was awesome. And while you can read recaps on about 50 different websites, I still can’t help but at least tell you how exciting it was. This game had just about everything that makes hockey exciting (aside from Sidney Crosby and Evgeni Malkin, still out with injuries). The Pens went up 2-0 in the first 1+ period of the game on goals by Tyler Kennedy (pictured above in warm ups earlier this season) and Arron Asham, who is having an incredible post season. TK’s goal was huge because it snapped the 0-Forever powerplay drought the Pens were on. Early in the second Asham tallied his to double the lead. But again, the Lightning fought back. Martin St. Louis took a beautiful area pass, scorched past Ben Lovejoy and buried it to the far side past Fleury. I’m not a fan of St. Louis at all, but damn that was one hell of a goal. Pittsburgh made it out of the second up 2-1 and looked like they were on their way to a victory by the same score until Sean Bergenheim found the puck in a scrum in front of the Flower and shoveled it home, knotting the score at 2 with just 3 minutes left in regulation. The first overtime came and went, but not before we had some more excitement. Craig Adams was called on a terrible interference penalty (one of many terrible calls by the referees in this series) that put the Lightning again on the man advantage. But then Pens held strong killing off all 4 Lightning powerplays last night. Max Talbot, Tyler Kennedy and Craig Adams all had odd man chances to score but couldn’t put it behind Dwayne Roloson. The defensive play of the night, however, was Paul Martin’ play on Lightning superstar Steve Stamkos. Stamkos took a pass up the middle and had a breakaway, but Martin smoothly came up behind him, lifted his stick and poked the puck away. Crisis averted. NHL playoff overtimes are the full 20 minutes, with no shootout and a full intermission in between. There are also no TV timeouts, so the players can get very tired very quick. This is a factor, since this game went into the second overtime. The Pens owned the puck for most of the fifth total period played, and it led to the play of the night. Jordan Staal won the offensive zone faceoff and James Neal (second and third pictures above) got a shot on net, which was turned aside by Roloson. The puck was swept around the end boards, and Kris Letang made a nice play to keep it in. Staal corralled it with his stick and through it behind him against the boards, where it was picked up by Neal who just tossed it on net. At the same time that announcer Bob Errey was saying “He just needs one” (referring to the fact that Neal hadn’t scored in 21 games) the puck zipped over Roloson’s shoulder for the game winning goal. 3-2 win and a 3-1 series lead as Game 5 rolls back to the ‘ Burgh on Saturday. So why Lucky 13? Since there are no first round byes in hockey, a team needs 16 wins to capture the Stanley Cup. The Pens have won 3, so just 13 more. You hate to call a game where the best of seven series is tied 1-1 a must win, especially in the first round. But that’s what last night was for the Pittsburgh Penguins. After a gem of a Game 1 by Marc Andre Fleury, the Pens collapsed in Game 2, losing 5-1 and looking terrible in doing so. Tampa Bay seized all of the momentum and they were playing Game 3 on their turf. The Pens needed to respond by being physical, putting goals up early, and staying off the penalty kill. They did two of those three things, and the one they didn’t (putting Tampa Bay on the power play) almost did them in. The Pens opened up the scoring early with Max Talbot and Arron Asham scoring just minutes apart to stake Pittsburgh to a 2-0. That would hold up until the Lightning were the beneficiaries of an atrocious penalty called on Alexei Kovalev for goaltender interference when in reality it was the defenseman who checked him into the goalie. Martin St. Louis scored in the waning seconds of the powerplay to cut the lead in half. In the third, the Bolts again went on the man advantage after a questionable interference call on Paul Martin. Once again, St. Louis came down from his position on the point, corralled the puck with his skate and buried it between the pad and glow of a sprawling Fleury. The Pens needed to answer quickly, and just 31 seconds later, with Tampa Bay goalie Dwayne Roloson looking for the puck between his legs, Tyler Kennedy scooped it out from right in front of him and put it home. Pens win, 3-2 and take a 2-1 series lead. Last night was a huge win, not just for the fact that the Pens did win, but because they got some of their swagger back. Kris Letang (first picture above) had one of the worst games I’ve seen him play in the loss last Friday, but looked very solid last night and earned the #1 Star of the game. Brooks Orpik (second picture above), known for his physical play, was back at it last night, sending players all over the ice. Game 4 is Wednesday night, and I think the Pens will be ready. And that is what Marc Andre Fleury looked like in last night’s playoff opener. It was possibly the best performance I have ever seen out of a goalie since I can remember, he was that good. Didn’t matter who was shooting from where, the Flower was making kick saves, glove saves, blocker saves, pad saves. I mean, it was just unbelievable to see. Obliviously the Pens won, 3-0, as Fleury earned his fifth career playoff shutout. This was a really important game, more so that a normal Game 1 of the first rounds of the playoffs. With no Sidney Crosby or Evgeni Malkin in the lineup, it was vital that the Pens were able to establish their game early and often against the high powered Lightning offense. Pittsburgh came out hitting, with Steven Stamkos, Ryan Malone and Vincent Levacalier getting the worst of it, especially Stamkos, who got absolutely destroyed by Brooks Orpik. The best part about watching that hit was the fact that everyone saw it coming. Everyone except Stamkos that is. As solid as any goaltender is, a team still needs to score goals. Even though the Pens were peppering the Tampa Bay goalie Dwayne Roloson with nearly 30 shots through two periods, they still weren’t able to put one in the back of the net. Then, about six minutes into the third period, Alexei Kovalev (pictured above from a game last week) changed all that. After he appeared to be tripped (with no penalty), he layed on the ice for just a second. When the defenseman drifted away, Kovy jumped up, took a shot-pass from James Neal, and buried it in the back of the net. Just 18 seconds later, Pens fourth liner Arron Asham (above, from last night’s game) streaked down the right side of the ice, faked a shot to draw Roloson away from the net, wrapped around the net and tried to bury one. It bounced off a stick, came right back to him, and he buried it in the open net. We were still going crazy from the Kovy goal, that half the arena didn’t even realize we’d scored again. Asham is one of those roll players I talked about yesterday who, if the Pens are going to win the Cup, needs to step up, and he did just that. Chris Kunitz added an empty netter to seal the game. Overall the Pens looked great. Hard hitting, great penalty killing, beating the trap that the Lightning play is what led to the Game 1 victory. The important thing is sticking to their game for the rest of the playoffs. Game 2 is tomorrow. And it can’t come soon enough. Well it all begins tonight. 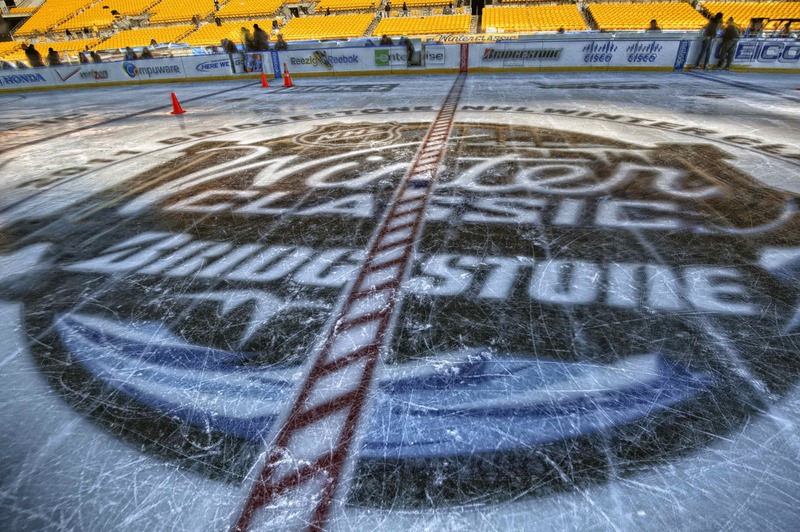 The 2011 Stanley Cup playoffs will open with the Pittsburgh Penguins taking on the Tampa Bay Lightning at the CONSOL Energy Center. It certainly has been a trying year for these Pens, but they have shown that they have what it takes to win under extreme adversity. They have only had the combined services of Sidney Crosby, Evgeni Malkin and Jordan Staal for two games this season, with Staal missing the first half due to a broken hand/severed tendon in his foot and Sid and Geno missing more or less the entire second half of the season. Yet these Pens have fought through rough stretches of poor powerplay performance, low goal totals and a host of other injuries to finish fourth in the conference and gain home ice advantage through at least the first round of the playoffs. So what is it going to take to win? The same things that they have been doing all year. Solid penalty kill. Team defense. Brick wall goaltending. And of course production from their role players, like Craig Adams, Max Talbot, Mike Rupp and others. I like the Pens in this series in five games because of all these factors, but one thing I think that really sets up apart from the Lightning is our consistency. We never really let the season get away from us, even with the loss our two biggest superstars. Yes, we did lose five or six games in a row after Sid was out, but that can be expected when you lose the main focus of your offense. The Pens are also very versatile while I believe that Lightning are much more one dimensional. They want to get the puck to Stamkos, St. Louis or Lecavalier and let them shoot. They rely too heavily on the powerplay and if they aren’t getting the opportunities, then they won’t be effective. The Pens have scorers on every line and guys that bring a high level of energy to team like Talbot, pictured above. I took this during a game back in February, and it’s always fun to photograph Talbot, as he seems to always be looking into the camera. He’s a guy who can win you the faceoff, kill a penalty, and then find himself alone in the middle of the ice for a breakaway. Max went through a bit of a dry spell early in the year, but the intangibles he brings to the team in the absence of their captain is immeasurable. Today’s shot is one I took at the last game I was at which was the last regular season home game. We were in a suite above the single attack zone, which is a great view to watch the game from. 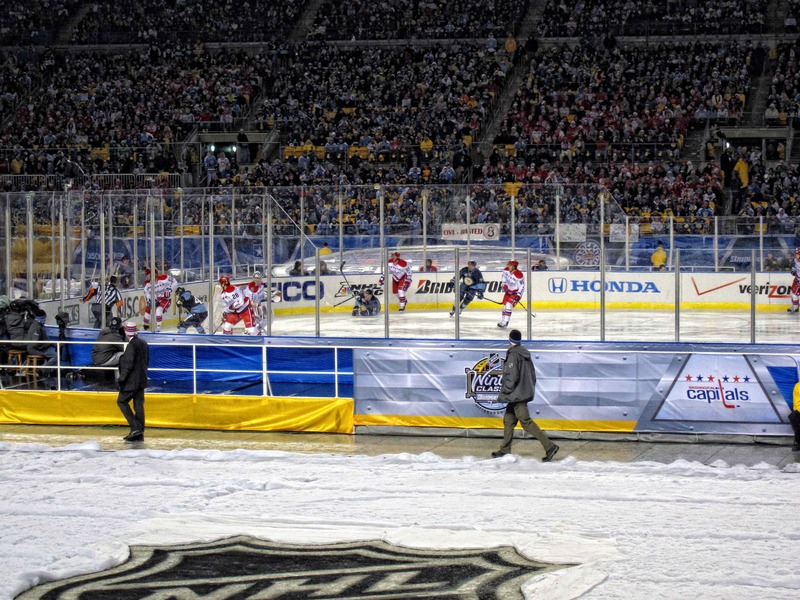 I took this HDR during the national anthem, as you can see by the stars and stripes on the ice. This is a five exposure JPEG HDR that I processed with HDR Efex under the “Clean” method. Since the players and scoreboard were both moving, I took the +2 exposure (for the players) and the -2 exposure (for the scoreboard), tonemapped both of those under the Clean method and masked in the respective shots of the picture to give it a crisp look. I also added a Pro Contrast filter in HDR Efex to give the shot a bit more pop. As a note, that is also Max Talbot on the video screen here as well. At the time I am finishing this, 11 hours and 39 minutes until puck drop. What a great way to close out the regular season at home last night at CONSOL Energy Center for the Pittsburgh Penguins. The Pens put up four goals on former Penguin netminder and current New Jersey backup goalie Johan “The Moose” Hedberg to move one step closer to clinching home ice for the first round of the Stanley Cup playoffs. The start of the game was a little shaky, as the Pens were trying to break the 1-3-1 trap that the Devils play, but once they got in the groove, they owned the ice, picking up goals Jordan Staal, Chris Kunitz on a great feed by Tyler Kennedy and two from Pascal Dupuis, one being an empty netter with time expiring in the game during a Devils powerplay. There is something magical about playoff sports, well at least for playoff hockey. I’ve never been to a Pittsburgh Pirates playoff game and only one Pittsburgh Steelers playoff game when I was younger, so playoff hockey is really the only playoff action I know. Don’t get me wrong, the regular is awesome, especially against rivals like the Flyers and Capitals. But everyone just seems to cheer a little bit louder, the players skate harder, and there is just a buzz that resonates throughout the entire building. Very few times will you see someone sitting back in their seat, casually watching the action. No, everyone is hanging on the edge, just waiting for that big goal to be scored by a superstar like Sidney Crosby or Jordan Staal, a talented young star like Mark Letestu or Chris Conner, or a grinding role player who is ever so important to the team like Craig Adams (pictured in the first shot above) or Max Talbot. Playoff hockey is about watching Marc Andre Fleury make an unbelievable save to bail out a defenseman and keep the game close or seeing Brooks Orpik or Deryk Engelland flatten someone into the boards so hard you need a spatula to get them off. I can’t wait. Today’s shot keeps with the theme of the post as it is the exterior of CONSOL Energy Center. While the new home of the Pens doesn’t quite have the character of the old Civic Arena, it still as its own mystique, especially early in the morning with the sun rising. I took this one a few months back during an early morning photowalk around downtown Pittsburgh. This is the lower gate of the arena, the American Eagle Gate, located on 5th Avenue. I thought that it was so cool how you can see reflections on the left side of the glass on the building, but in the front you can actually see right through into the stairwell that ascends to the seating level. This is a nine exposure HDR processed in HDR Efex under the “Clean” HDR method. After fixing some of the dust spot, I masked in the entire blue sky, because I wanted it to be rich and contrast nicely with the warm look of the building. I also added blue and red layer curve adjustments to bring out some contrast in the sky and building, and a slight selective coloring layer to enhance the sun. Finally I added a Tonal Contrast filter in Color Efex and sent it off the blog. Thanks to everyone who stops by, see y’all tomorrow. First off I just wanted to thank everyone who gave their input on flickr and Explore in my post yesterday. I really enjoyed the feedback and hearing some different views on it. Yesterday’s post was a bit long in verbiage so today I’ll give you a break and make it a bit longer but in pictures. Every so often I like to put up a whole series of action shots that I took before the Pens games and today is just one of those days. Originally I was thinking about doing this for today’s post because I thought that we would have pulled out a great win last night against our hated in state rivals, the Philadelphia Flyers and pull even with them for the division lead. The Pens were looking great to, all over the ice, help two one goal leads, but the Flyers proved the luckier of the two teams last night, with pucks bouncing over, around and under Marc Andre Fleury for a 5-2 win by the men in orange. So where does that leave the Pens? Probably in fourth place at the end of the season, which means that we will have guaranteed home ice advantage, at least for the first round and that our like opponent will be Steven Stamkos and the Tampa Bay Lightning. I like this matchup for Pittsburgh, as the Pens are a much deeper team than the lighting with a lot more playoff experience. However, anything can happen at any time in the playoffs. On to the shots. The first one above is Mike Rupp, and I thought that this one was appropriate to start off with as it was one of the first pictures I took from last Friday’s game. All the images you see here today are from that contest between the New Jersey Devils and the Pens, which the Pens won in a 1-0 thrilling shootout victory. I was able to capture this one right as Rupp skated on the ice, and I was lucky enough to get the spot light right on top of him, which has never happened before. Next up is winger James Neal, one of the players taking the Pens to the new horizon. He came over from the Dallas Stars along with Matt Niskanen back at the trade deadline for Alex Goligoski. Neal is a hardnosed, physical player who has a lethal wrist shot. He’s got speed and puck handling ability and was a very valuable add to the roster this year. Above is Ben Lovejoy, a right handed shooting defenseman who has certainly made his mark in the NHL this year. Lovejoy is a shutdown d-man who has a decent shot too, and always willing to jump into the offensive play. I’m posting this more for the funny expression on his face than anything else. Here we have Mike Comrie, another new Penguin this year. He was signed as a free agent, and although he has missed most of this season due to hip surgery, has put up 30 goal seasons in his past. I happened to catch him right as he was spitting in warm ups, which made for an interesting shot. Taking a shot during warm ups is winger Pascal Dupuis. Dupuis is a high energy player, very quick, always flying around the ice. He gets a minute here or there on the penalty kill, but strength other than his speed is his killer slap shot. He may not be able to maneuver around you, but he can definitely rip it past you. Last but certainly not least is a name that is near and dear to many people in Pittsburgh and that is Alexei Kovalev (right in the above shot), or Kovy. Kovy is on his second tour with the Pens, reacquired at the trade deadline this year for a conditional 6th round pick from the Ottawa Senators. Though he has only put up two goals (and two more in the shootout), Kovalev can still wheel and deal the puck with the best of them. The game is certainly faster than the last time he played for Pittsburgh and was in his prime, but it’s still so much fun to watch him play. He showed off some of that stick handling ability in the bottom shot here, where he bounced the puck on his stick from the red goal line all the way to center ice. Just awesome. Today’s shot is a view from our new office building that my company moved into on Monday. We have a great view of the sunrise, which is much better than the view we had before, which was none, as we were smack in the middle of our last building with no windows at all. I know you can see the reflections of the lights in the window, but I just wasn’t able to clone them out. If you look directly to the right on the bottom part of the reflection, you can see the moon as well. This was a seven exposure HDR processed with HDR Efex under the “Natural” setting. No masking in this one, just adjusted overall curves and then added a green curves adjusted layer to enhance the grass. Cloned out a few dust spots, increased overall saturation and finally added a Tonal Contrast filter to everything but the sky. Well, that ended up being longer than yesterday. I’ll try to keep it shorter tomorrow. There’s something about Monday morning that just feels so wrong, especially on days when there is a torrential rain/thunderstorm going on outside. Especially after a weekend where it was starting to warm up, got a chance to relax, the sun was out. Ugh. That’s all I can say about that. Today I’m going to fall into the category of typical photoblog as I have some catching up to do in regards to pictures that I’ve posted on my flickr photostream. Since I like to walk through how I do my processing, and with three pictures that I spent a decent about of time on, I want to make sure that I cover everything. In conjunction with that thought, I will be putting together a Photoshop Effects Tutorial Page where I go through some of the most common processes that I do, like High Pass Sharpening, the Orton Effect, to name a few. Yes, some of them are pretty simple, but when I was first figuring out what the heck I was doing when it came to Photoshop, I always had a ton of browser windows open because no one website seemed to have them. I’m not saying that mine will either, however, it will give you a place to go to if I say I used a certain effect in my processing, you can jump to that page and see how it was done. I’m hoping to have it up by next week. So on to some shots. No not that kind. Although Monday morning probably would be a good time to start taking some. Might make the day go by a bit quicker. The first one is something that I don’t normally do, one that I’ve posted only seven of them as the subject in the 1,040+ of the pictures I have on flickr. Flowers. Yep. I don’t mean multiple Marc Andre Fleurys (he’s called the Flower because of Fleury, fleur-de-lis, ok, ok, you got it). I got Dana a bouquet of flowers for her birthday a few weeks ago (lucky for me she doesn’t like red roses) so I thought I would see if I could have some fun with them. Through on the 50 mm 1.4 and shot away. No HDRs, just a single exposure. First I cropped the image, as there was a chair in the bottom right hand corner. Put it in Color Effex and added a Glamour Glow Filter and then ran it through again and added a Pro Contrast filter. Even though the focus was on the center flower (nope, don’t ask, have NO idea what it is), and I did get some nice bokeh (we’ve talked about that already, out of focus part of the picture), I still added a vignette to bring out the center. At first I was a bit upset that I got the window (blue part) in the back of the frame, but that I unded up doing a curves level on the window to help bring out the blue even more. Increased the vibrance and the purples in the image, and I liked the way it turned out. Image number two of the day is from the early Saturday morning photowalk I took last week. I haven’t really been too successful getting pictures of the moon in HDR, they always end up very blown out. Well, on this particular morning, the moon was huge in the sky, so I thought I would give it the old college try. First attempt (which I will post in the a few days because I still like the shot) was no good. Second attempt (which I won’t post), was worse. Finally, I decided to head over the Ft. Duquesne Bridge, as I wanted to get the sunrise from the North Shore. The moon was hanging in the valley between the two hills of Mt. Washington, with Heinz Field on the right, and I thought that I would go for one more. Seven exposures later and I got what I wanted. Merged the images using HDR Efex, using the Clean HDR Method. I ended up masking in the entire sky from the -2 exposure, as I didn’t really like the colors that I was getting from the HDR, they weren’t what I remember seeing, and this was. I also took the -3 exposure and masked in just the mood, just to the point where you can see the darker parts that you can see with the naked eye. Added an overall saturation layer to the entire image, and then I had to go to work on the grass. Grass and winter really don’t mix, and the section below the stadium was pretty brown. I did a Color Select on the shades of grass, then did a Curves adjustment on the greens to bring them out to add some pop to the image. I also did a Color Select on the yellow seats of the stadium to bring them out a bit more. Added a Tonal Contrast in Color Efex and finally a High Pass Sharpening Filter and I was good to go. Lastly, today’s shot. So after I took the previous shot, finished walking across the Ft. Duquesne Bridge, got a few shots right off the bridge, I made my way up past PNC Park, where I wanted to get the sunrise. They are currently doing construction on the Riverwalk, so I had to divert and actually walk past the stadium. The glow of the sun was just coming up in the corner by the home of Pirates, and the wide angle gave it almost a fish eye look. I set up shop right in front of JP “Honus” Wagner and snapped away. Combined the seven exposures in ﻿HDR Efex with the Natural setting and then kicked it over to Photoshop. Once again, I wasn’t overly pleased with the sky, so I masked in the entire -2 exposure. I also had to mask in a little bit of the top of the stadium, mostly the steel beams on top, to bring back some of the detail. Again, I increased overall saturation, and also added an extra blue Curves layer for the rest of the sky. Applied a Tonal Contrast Filter in Color Efex and another High Pass Sharpening Filter and called it a day. Well, I know that was more than I usually go through, especially on a Monday morning, but I wanted to make sure that I had everything covered. I also know that I made no reference to the title. I really did mean to. 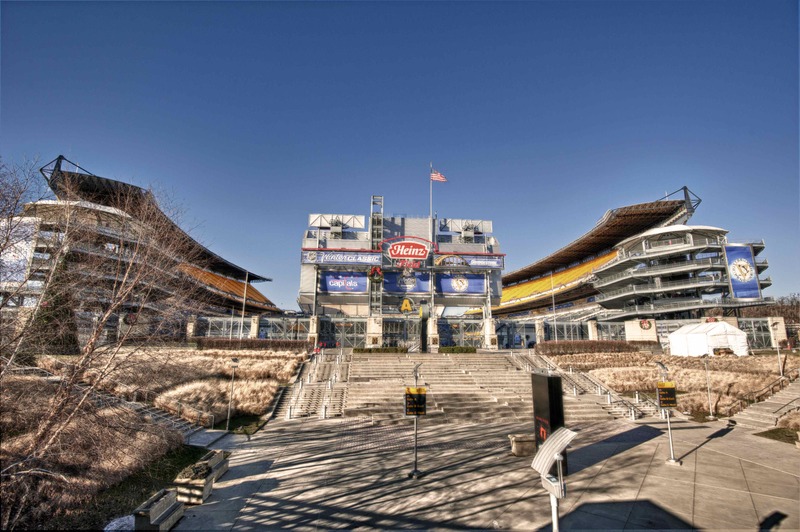 I was trying to play on the Steelers and Pirates stadiums, Pirates worst in the league for 18 seasons, Steelers made it to the Super Bowl again, etc., etc.. Also for the fact that I posted something other than a wide angle cityscape. One more thing. Alexei Kovalev of the Pittsburgh Penguins? A goal in regulation and then the shootout winner on Saturday night. Welcome home Kovy. I really can’t help but at least talk about the Pens for a little bit after a game. Although they lost again last night, which is getting to be a common theme with the rash of injuries they’ve had, there were some sparks in the lineup that certainly give you some optimism. Tyler Kennedy, on a bit of a tear as of late, scored two goals, and Marc Andre Fleury looked absolutely brilliant in the loss. The goals, a one timer from behind the net on a power play, a bad bounce that game right to a Shark who jammed it home, and a scrum in front of the net with Fleury down, can be easily forgiven. The offense has to get going though, averaging only 2 goals a game since the departure of Sidney Crosby, last in league by a long shot. I’m not giving up on the season yet. Let’s go Pens. Some shots from the game last night. The first one is a thirty image panorama that I took with the iPhone and stitched with AutoStitch. I think that it game out pretty cool. The second one is a tilt shift that I took with the S95, as that is a custom scene on the phone. Also not too shabby. This is a seven exposure HDR processed under the Clean setting on HDR Efex. After cleaning up all the dust spots in the sky (yes I forget to clean the sensor before I went out. Come on, it was 6:00 a.m. on a Saturday. Gimme a break.) I could go to work. First, I selected the tree and recovered some of the shadows on it. I wanted it to be silhouetted, just not as much as it was. I added a green curves level to enhance the grass and the bushes, as well as did selective coloring to give the sun a more reddish tint, as it was a bit too yellow for my liking. Kicked it over the Color Efex where I added a Tonal Contrast layer on everything but the sky, and finally added some High Park Sharpening. I really like the result, one of my favorite shots that haven’t been from New York in a while. That about wraps it up for today. One more day til Friday. Usually coming up with a title is one of the more difficult parts of writing these blog entries, but today was easier than most. If you stopped by on Friday, you read that this evening will be a rematch between the Pittsburgh Penguins and the Washington Capitals at CONSOL Energy Center in Pittsburgh. This is not the first time the two teams have played since that cold, rainy New Year’s Day game, but it’s the first time the Caps have been back in town since then. The make up of the Pens is vastly different this time around, with the ranks still being depleted by injuries. It’s going to be a good show none the less, as it is always is when two rivals face off. Rivalries are one of the best things about sports. Of course every fan dreams about their team winning a championship, as that is the ultimate prize for any league. Individual player awards are nice, but they don’t do a whole lot for the fans. Rivalries though, that is what really gives sports that edge, that intensity, that can’t miss game appeal. It’s amazing how rivalries in games can transcend into the culture of an entire city. Take my hometown, Pittsburgh and their football team the Steelers (notice I said their, not our) and one of their most hated rivals, the Cleveland Browns. The competition between the two teams has spread from the football field and into the streets of the cities, with Cleveland being called “The Mistake on the Lake”, t shirts that say “The only sign of intelligence in Cleveland is ‘Pittsburgh – 170 miles’”, and general ridicule for all things Cleveland. It doesn’t really help that the Browns haven’t been able to really field a competitive football team in years, but I think if they had, it would only fuel the rivalry further. There will also always be those classic rivalries, like Lakers-Celtics in the NBA, Yankees-Red Sox in baseball, Packers-Vikings in the NFL and Duke-North Carolina in college basketball. But it can be really exciting to watch rivalries grow, like the one between the Pens and Capitals. Sure they have been Eastern (or Wales back in the old days) Conference competitors for decades, but with the emergence of Sidney Crosby and Alex Ovechkin as the two best players in the world, it has taken the feud to an all new level and makes them the most exciting two teams to watch in the league, especially when they play each other. No matter what happens with for the rest of their careers, Sid and Ovechkin have left their mark on these franchises that will last a lifetime. On to the shots. 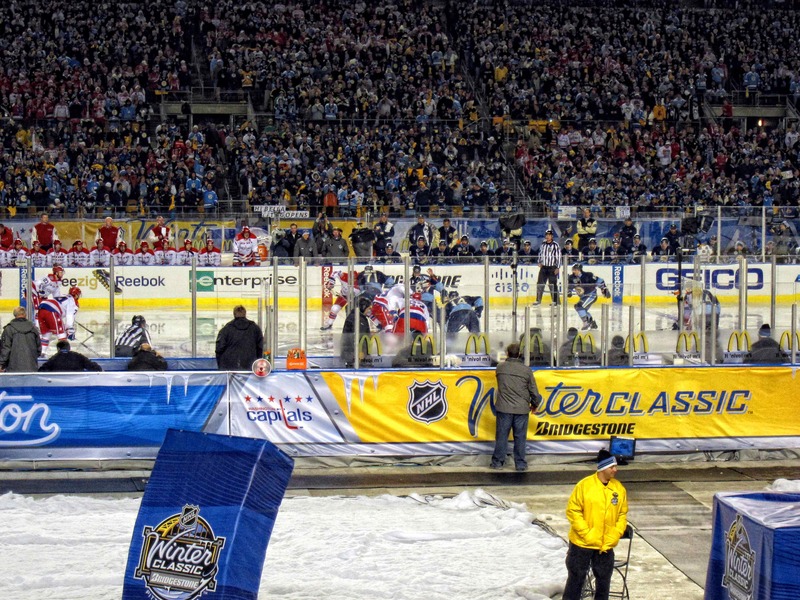 I won’t be going through the processing on these, just wanted to share a few sights from the 2011 Winter Classic. Check out the caption below each for the description. 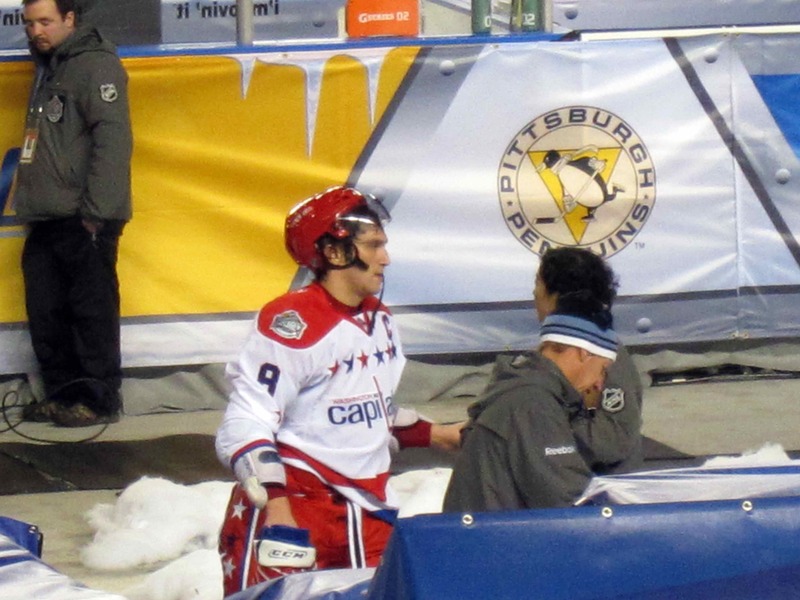 You’ll have to excuse the quality on the close ups of Sid, Geno and Ovechkin. We weren’t allowed to bring in big cameras, so I had the S95 at full zoom, which doesn’t giving the most crisp shots. The other in game action shots were taken with it as well, and they turned out great.